President Trump, who attended church on Sunday, held his own sermon on Twitter in defense of controversial Fox News hosts Jeanine Pirro and Tucker Carlson. “Bring back @JudgeJeanine Pirro,” he demanded of Fox News. Pirro, who’s hosted “Justice With Judge Jeanine” since 2011. The show, which airs Saturday evenings at 9 p.m., was replaced March 16 by a rerun of the documentary show "Scandalous" a week after Pirro made contentious on-air comments about Rep. Ilhan Omar, D-Minn., one of the first Muslim woman elected to Congress. "Think about it,” Pirro began on her show last week, “Omar wears a hijab, which according to the Quran, 33:59, tells women to cover so they won't get molested. Is her adherence to this Islamic doctrine indicative of her adherence to Sharia law, which in itself is antithetical to the United States Constitution?" 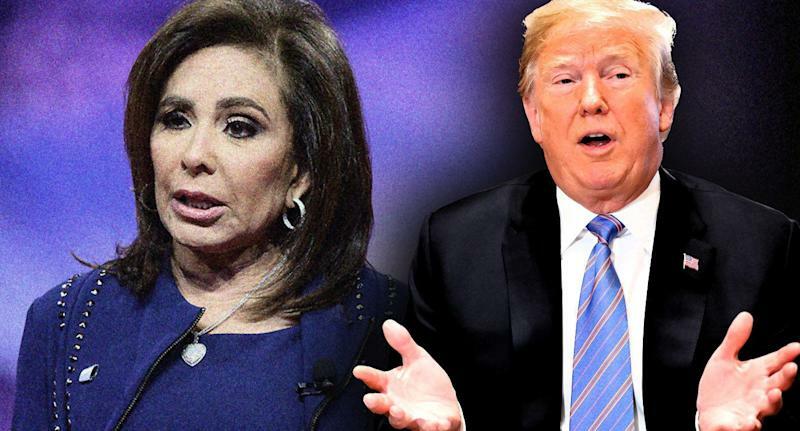 Pirro faced immediate backlash from her comments about Omar, who herself faced criticism after making remarks interpreted by some as anti-Semitic. Pirro lost advertisers and in a rare rebuke, was publicly condemned by her cable news network, although she has not been formally suspended. Pirro has not apologized for her remarks, but defended her position in a statement on Monday. "I've seen a lot of comments about my opening statement from Saturday night’s show and I did not call Rep. Omar un-American," she said. "My intention was to ask a question and start a debate, but of course because one is Muslim does not mean you don’t support the Constitution. I invite Rep. Omar to come on my show any time to discuss all of the important issues facing America today." But Trump urged Fox News to reinstate Pirro, whom he’s personally known for years. “Fox must stay strong and fight back with vigor. Stop working soooo hard on being politically correct, which will only bring you down,” Trump wrote Sunday. Although advertisers dropped Carlson's show, “Tucker Carlson,” he remained on air, where he refused to “bow down” to the liberal “mob” and thanked Fox News for standing by him.